As it says in my bio for this site, I’m a calculator collector. Mostly Hewlett-Packard LCD calculators it must be said, but every now and then I pick up something from another manufacturer. 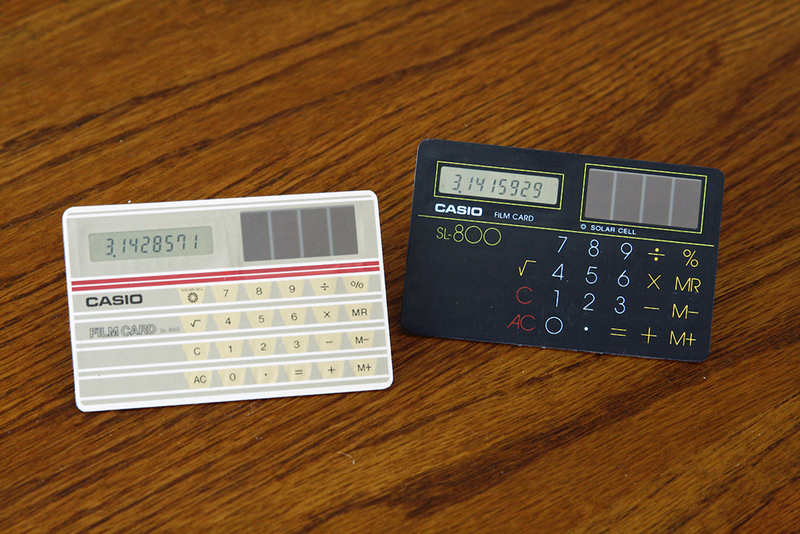 Back in the early 80s, I remember buying one of these Casio SL-800 calculators for fun, a gold one. And then – because it was the size of a credit card -- I put it into my wallet, which of course sounded its death knell after a few months. They are just not that robust. Sad to say, my original one bent and came apart and I didn’t bother replacing it. These SL-800s really are the size of a credit card, not only in width and length, but also in thickness. Yes, like a credit card, they’re only 0.8mm thick. This is an edge on view of the black one with a quarter alongside for comparison. As you can see, they’re a simple “four-banger” type calculator with memory, running off solar power. Originally made from 1983/84. Without the thickness feature, these two calculators would be totally and utterly uninteresting. Because they get wrecked pretty easily, they tend to go for relatively high prices on eBay, say between $50 and $100. Mine came with the original instructions, warranty document, and slipcase box and look unused. Julian, Speaking of credit card sized calculators have you seen http://www.rpn-calc.ch/ ?